Interactive map of 8 African biomes. Geography learning game. 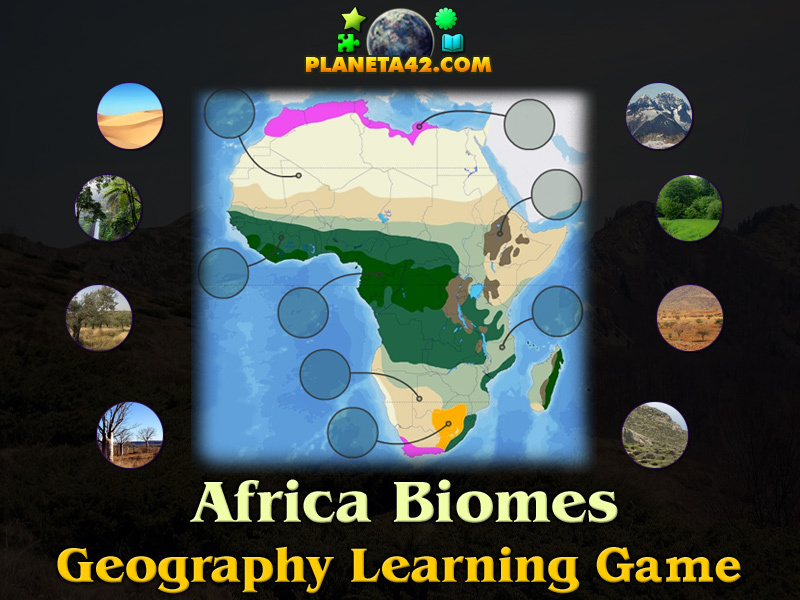 "Africa Biomes Puzzle" is a free online knowledge level game to find the correct biome of Africa environment map. 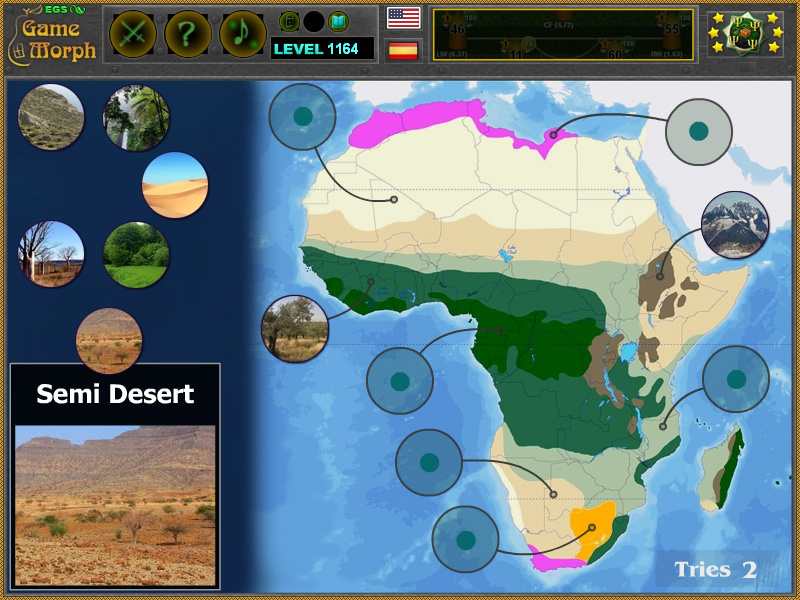 Fun educational geography game to exercise or study the habitats and terrestrial vegetation of Africa, suitable for online lessons and interactive classes. Minute to win it game. Bimes game. How to play Africa Biomes Puzzle. There are 8 movable pieces of Africa biomes situated on the left side on the screen. Drag and drop them on the correct slot of africa environment map to the right of the screen. The information window shows a beautiful view of the biomes. Know 3 biomes of Africa and get +1 Knowledge Level. The climate of Africa ranges from tropical to subarctic on its highest peaks. Its northern half is primarily desert, or arid, while its central and southern areas contain both savanna plains and dense jungle (rainforest) regions. In between, there is a convergence, where vegetation patterns such as sahel and steppe dominate. Africa is the hottest continent on earth and 60% of the entire land surface consists of drylands and deserts. Source of Africa map: UN Environment Programme - UNEP. What environment zones do Africa have? How many biomes are there in Africa? What is the location of the deserts in Africa? Where do jungles grow in Africa? What are the biomes of Africa? What habitable zones do Africa have? Labels: Biome Games , Interactive Maps , Africa Games , Puzzle Games , Geography Games , Education Games , Free Online Games.